US stocks in November 2008 – are they undervalued? There are people which think that buying stocks now would be the right thing to do. Stocks, they say, surely look undervalued and should be bought now (Buffett, btw, disagrees). But this argument is based on nothing but looking backward: it’s based on nothing else than the belief that the stock market will return to where it has been and do so in the near future. Why should this work? Why, it has always worked. It should therefore not matter that we do not understand why. This is where N.N. Taleb would come in and say: the turkey had a very good time, enough food, a dry place, so why worry? But then came Thanksgiving. And the happiness index never reached those heights again. What I want to say is that the stock market might go up, and it might go down. But basing guesstimates only on the past to me seems to be not a scientific way to tackle this. And pointing to price-earnings ratios does not increase the quality of the forecast, since we have just seen that risk models were not able to determine the value of an asset. With the world economy in turmoil, who knows where earnings will be next year? Even finding the fair value of assets for accounting purposes of banks has turned into an almost philosophical task. Everybody knows that stock markets are partly driven by psychology. But some restraints apply. And debt-laden US consumers trying to work off their debt probably are running into financing restraints which might leave buying equity with a low priority. So, even if Japanese stock looked undervalued in the last 10 years or so, you would have lost an awful amount of money in that market. 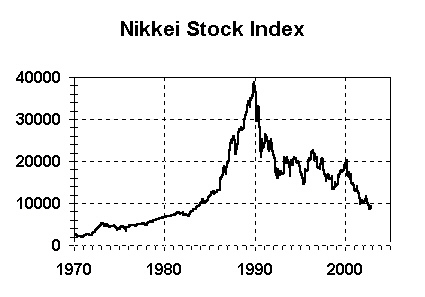 And I doubt that the Nikkei will return to 40,000 in the foreseeable future, so sitting it out might not be the option. This would, of course, destroy a lot of conventional wisdom of finance. But theories describe reality, and reality can change. As the Nasdaq often leads the other indexes in America, I would wait for the Nasdaq to break 1765 signaling a buy on the market before looking at individual stocks.